The First Grand First Principal of the District Grand Royal Arch Chapter of Antrim. 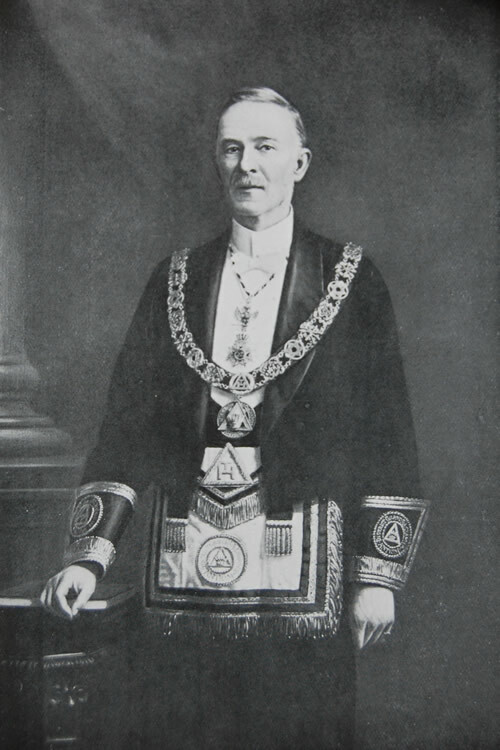 Presented by a number of his Masonic friends, to mark their appreciation of his long and faithful services on behalf of Freemasonry, February, 1914. R.W.Bro. W. Redfern Kelly, 32o, was elected Prov. Grand Inner Guard in which capacity he headed the great procession of the Craft on the occasion of the laying of the foundation stone of the Masonic hall, Arthur Square, in the year 1868. His energies never relaxed in the interest of the Craft, Royal Arch, High Knight Templar, nor in the still higher Masonic grades. When the District Grand Royal Arch Chapter was established he was selected to fill the position of Grand First Principal of Antrim, which he held until failing health necessitated his resignation. Even as an octogenarian, his mental energies remained quite unimpaired and found agreeable outlet in the study of astronomy, psychical investigation, and masonic research, contributing frequently to the Press.